I'm finely starting my own bench thread. I'm starting his thread for primarily two reasons. First as a kind of thanks for all the Maestroneter's that have and continue to help me. Second is to get critiques on my work. I tend to be very self critical, so I am perfectly aware of the many flaws in my work. What I'm most interested in are the things that I fail to see. So be nice (polite) but take the gloves off and don't hold back! 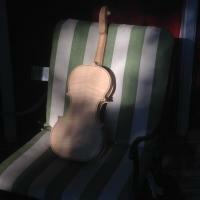 I will try to keep my thread related to violin making, even if only obliquely so. Is it okay if I come and rubberneck? In the paraphrased words from the dark recesses of my memory, Joe Robson once said (or wrote) if you want to learn to varnish, varnish every thing. Here is a Sapele coffee table top that I'm building for the family room. I first applied many coats of BLO to darken the wood and make the grain pop. Then I finished the top by padding on several #1 pound cuts of platina shellac (dewaxed). 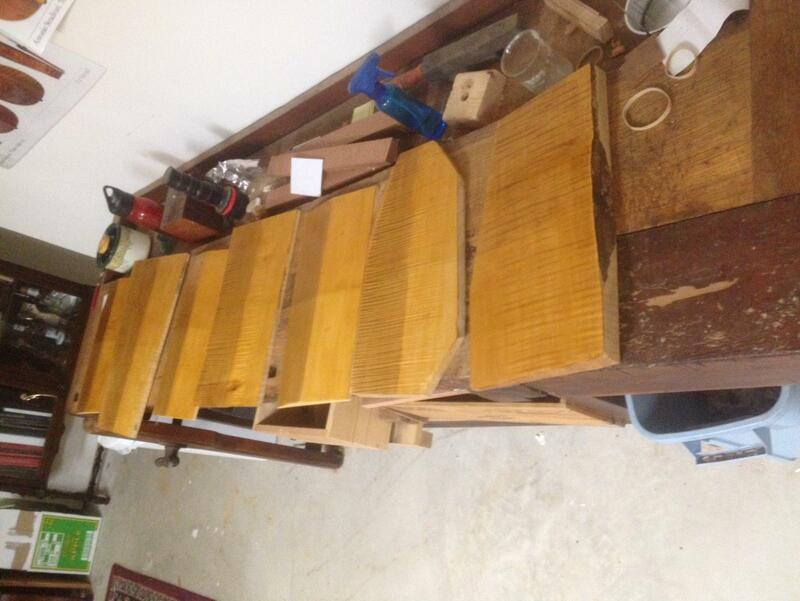 Next the open pores were filled by rubbing in the existing shellac, wood fibers under the shellac, and 4F pumice. All this was done with heavy coaching by Michael N. Thanks Michael! 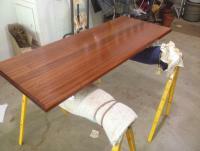 Then many more coats of shellac were added until I got the look I wanted. I'm very happy with the color and chatoyance in this piece. Right now the I'm going through the difficult task of not touching it for a week to let the shellac harden up before rubbing out the finish. Using the pad and learning to "listen" to the pad for when I needed more or less pressure, or to reload the pad with shellac was a good warm up for spirit varnishing with the brush. I'll start talking about that next. Of Course! Silly comments are also welcomed. Excellent! I'm an expert at silly (and according to Jacob, thoughtless) comments! That table is going to be lovely! I have to say, in a lot of ways, french polishing something that size is way harder than waving a brush around a violin for 10 minutes! Thanks Matthew. The picture doesn't show striping the shellac three times and resanding an additional time to get out all the white specs showing in the pores from when I didn't properly clear the pumice and/or used too much pumice. Definitely a good learning experience. I did all my practice work on the bottom. After verifying all the ways it shouldn't be done on the bottom, the top went pretty smoothly. On to violins. I finished #1 in the white so I really can't put off varnishing any longer. My varnish tale and restrictions are pretty much all laid out in this thread. While there are many right ways to varnish, I need a complete method that I could follow and then from there tweak to suite my needs. I bought the Scott Hershey Spirit Varnish DVD and don't regret it. In addition to having a start to finish system complete with recipes and prep instructions you get to watch someone do all the steps. Invaluable information for someone without a teacher. However I'm curious by nature, not easily satisfied, and as a scientist I have the occupational hazard of always wanting to test things. I wanted to test 4 surface preparations (which turned into 5) and three spirit varnish recipes. The details are in the other thread, so I will abbreviate the description here. I wanted to test which surface prep was most appealing to my taste. What I learned is that stain with tea + PD turns white wood brown and UV tanned wood red-brown. I also learned that I prefer UV tanned over white and stained with UV over just stained wood. Unfortunately the PD concentration I used (1g PD/ 250 ml water) very slightly burned the grain. It still looked good, especially after the ground coats (lemon and rubin shellac) but I wasn't quite happy with it. More later SWMBO needs me to run to the store. I'm back. Not being quite satisfied with the very minor burning of the maple grains from the tea + PD stain I set up another back. I planed one side flat. Like all the others test billets, the wood is plenty thick enough that all my treatments and varnish will be removed with a gouge. This time I divided it in half (upper and lower). I tea stained both halves and then stained the upper half with a more dilute PD solution (1g PD/ 500 ml water). Basically I just added water to the PD solution until the level was doubled. I didn't take the time to sun tan the billet. This time there was no burning of the grain lines, so I've settled on my wood preparation. A moderate tan, just enough to give the wood a light golden color, tea stain followed by a weak PD stain. Next I divided this latest billet lengthwise into thirds to test all three varnishes on the same piece of wood. One coat is already on, and I plan on doing 4 coats. The formulations are at different thicknesses so I might do additional coats to arrive at the same color. The Hershey varnish calls for 2 days drying time, so I'm treating all the varnishes the same. The Hershey varnish is also the thickest so that might be part of the reason. Interestingly, The Hershey varnish left pronounced brush strokes, however they self leveled after a day. Second coat tomorrow. I'll show my favorite when I'm all done. but here's the group with the first coat because I know Rue likes pictures. My tests have been done for a week. Nothing really picture worthy because all the varnishes used the same batch of stick lac so they all look the same. Each varnish "liked" to be applied a little differently to get good results, but all worked fine. However the thinnest varnish (Fiorini variation) was the easiest to apply. Was that because it was thinner or the formulation? No idea. They are all hard enough to not take a 10 second thumb print squeezing for what I'm worth. Dragging the edge of my fingernail across the varnish left a light scratch on the Hershey and Fiorini varnish, but not the Fiorini.2 varnish. Judging by feel and depth/ease of scratch the varnishes from softest to hardest are Fiorini, Hershey, Fiorini.2. So then I broke out the hammer. I gave each varnish a wack (technical term ) with the edge of a hammer head. All three dented, but none showed any sign of chipping. So I wacked again a little harder with the corner of the claw of my hammer resulting in a deeper, sharper dent. Still no chipping. Fine one last test. I took the corner of the claw and gouged across all three varnishes. Same gouge mark no chipping. based on my results I would be fine with any of the three varnishes. For now my choice is the Fiorini.2 varnish. I'll repeat the torture tests every year until it time for the wood to become a violin. I got my UV box set up and started tanning #1. I'm using four F40/350BL black light bulbs. After some trial and error, keeping a bucket of water between the lights and only closing the door on the side with the lights/violin keeps the temperature pretty steady ~ 79 F (26 C) and 51% RH. I rotate the violin a quarter turn each day. Catching some late afternoon rays. He asked for a beer while relaxing after work (hanging in UV box), but I reminded him he was still too young. That bench was a great Craigslist find. $200! Discovering all the nails when flattened the top with my LN #6 brought out some very colorful language. From the start I named my #1 "Johnny" after a cartoon my son used to watch, "Johnny Test". An often experimented on child. Like the cartoon child it has some how survived. Although now I may change it's name to "The Lazy Fiddle". After 4 years in the making it's kind of earned it's name (or maybe I have). They way I understand it from reading wood working sites, the coloring from PD is a chemical reaction with the wood, so its not a stain in the traditional sense. The color produced depends on the wood species in effect producing the color the wood would acquire with age. 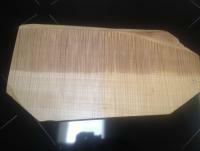 The chemical reaction is activated by the tannic acid in the wood. The primary reason I'm using a tea wash is to increase the tannic acids (not sure the acids in tea are actually tannic acids but they work the same for this purpose) to help the PD fully react because maple and spruce are both low in tannic acids. 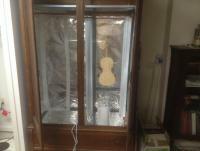 I have cut offs of the belly and back for this violin that I am also tanning in the UV box. I will use my diluted PD solution on the cut offs, but applied thinner. This way I can add additional layers of PD and sneak up to the "too much" line. At least I have plan. I'll find out if it's a good plan after I do it. I don't go looking for experiments. They just seem to find me. 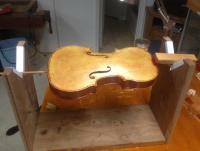 The violin looks good, thanks for sharing the pictures. I have also experimented with various chemicals to darken the ground, but I'm not so sure of it anymore. On the plus side is that is easier to get enough darkness in the varnish on an already dark ground, with fewer layers. Hi Fjodor, thanks for the complement. The back looks better than the front. I really botched the corners. I was concentrating on making the blocks 90 degrees to point where corrections changed the dimensions and I didn't realize it until after I cut the plates out. That's what #1 is for. Unfortunately, I made the garland for #2 at the same time, but I didn't do as bad a job and I'm hiding the flaw better. I have a look I'm going for that I've seen occasionally from different maker's. Very transparent and more red than brown. Something like the red violin in Michael Koberling's bench post #2. Not to everyone's taste, but it's what I like. At least I have something to aim for instead of just shooting blind. Thanks for commenting. (sigh) I've stripped the top twice now. I was almost done the second time when I forgot my lessons learned the first go around. I basically tried to get too much done at once. My spirit varnish is pretty dark. The color builds seemingly from almost nothing on the first coat then darkens really quickly after four. It's easy to recover from an area that's too light, but too dark just gets me in more trouble when I try to knock back the color just a little. The rest of the violin is ready for the "clear" coats and I really like it. The third try will work. Because I'm almost out of my color varnish. Jim, lessons learned. It does only take about four coats for color varnish to really start to show up. I've also found that if you go much more it starts to lose transparence, it can make a really nice back look pretty plain. 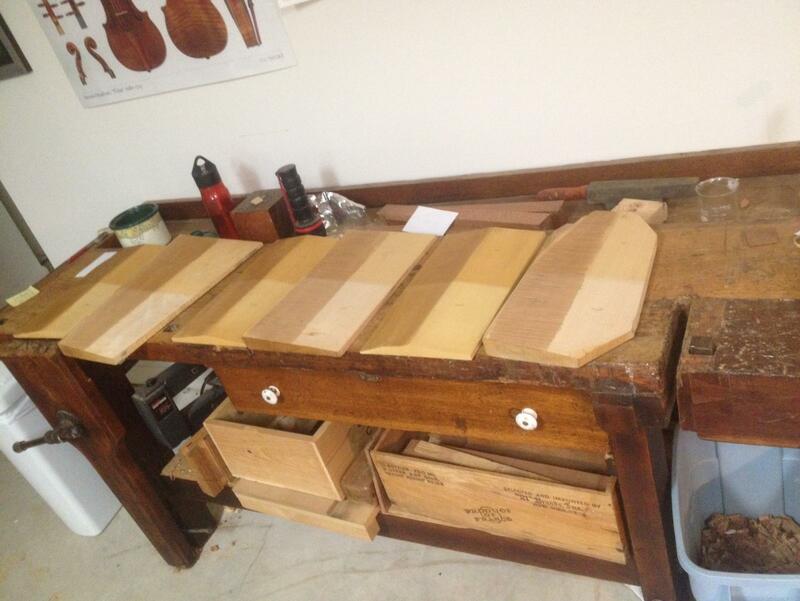 Also I've never just stripped a top or back, I do the whole instrument and start over. I don't know how you stripped your top but I've tried different things and paint and varnish stripper work the fastest and easiest. It does not hurt the wood. Just wash well with clear water when done and dry with paper towels. I'll take a picture of my cradle I made thirty years ago. 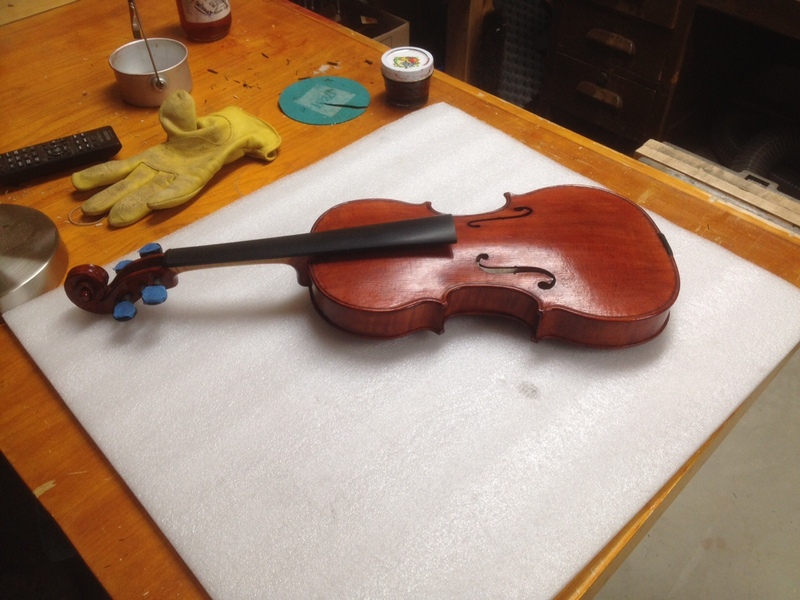 It's simple to make and holds the fiddle in the position you want. Hi Berl, Troubles and all, I'm still really enjoying the varnish process. I guess it's because I recognize my mistakes, or I'm just nuts. I've taken to saying out loud "stop, walk away" and setting a 2 hour timer on my phone. That's the hardest part, not tinkering with a spirit varnish. For stripping I dip a paper towel in ever-clear and just rub the varnish away a bit at a time. I like what I have for the back and ribs so I didn't want to start over. The back and ribs are the same color. The scroll was initially darker. Different maple that darkened much more from the same UV and stain. Right now it's a little lighter (3 coats I think) than the ribs/back but I'm not messing with it until I get the belly where I want it. I added a little more ever-clear to my color varnish and it has made a world of difference. I hadn't realized it was getting thicker which was affecting the evenness of the color application and how the varnish brushed on. Three coats on the top now and getting pinkish/brown. From my experience with this varnish so far, the color will darken quickly from here. If I mess up again I may have to strip the whole instrument because I will have to make up a new batch of color varnish which is unlikely to be exactly the same color. 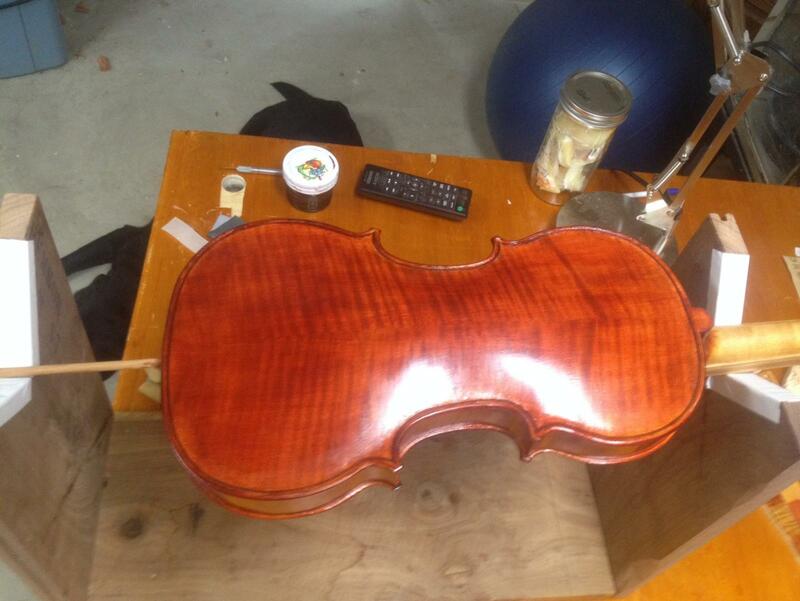 It's my #1 instrument, but my third top varnishing, I think it will work out. It's going better than the first two attempts at any rate. I'd love to see your cradle. This one works fine (salvaged flooring), but I have to have the scroll off to the left so I can control the violin by holding the neck with my left hand, I brush with my right. some times I just hold the violin by the neck without the cradle. It makes it easy to adjust the violin so the desk lamp is shining right where I need it. Like for the underside of the edge-work. Almost ready to string up #1! I have to buy a couple of we little drill bits for the pegs, and I'm still doing minor touch ups after re-gluing the finger board. I seem to get most things right, or right enough on the second try so I expect to go through at least 2 bridges. Trying to sell the house and prepare for a move is definitely putting a damper on progress. Exciting! Looking forward to the completed product!